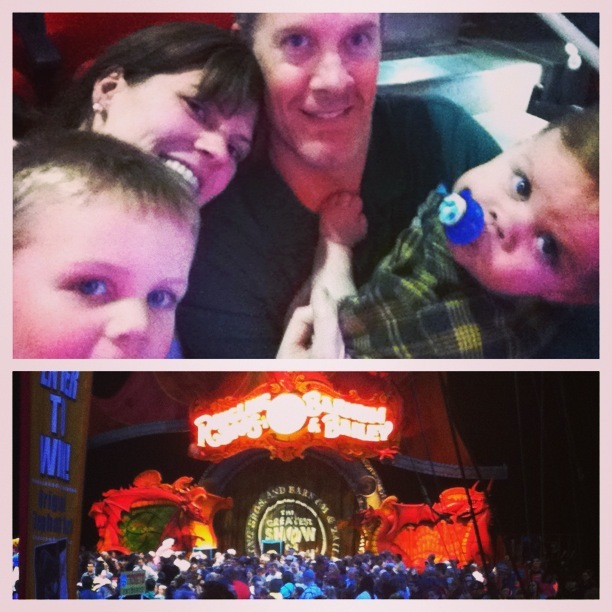 Last night, my husband and I took Oscar (4) and Calvin (18 mos) to the Ringling Brothers and Barnum & Bailey Circus. We were all very excited to go and it truly was a spectacular event. The talent was amazing, the music was fun and there were just enough daring acts to make me catch my breath a few times! That said, there are a few things we definitely could have done differently to make our children a little bit more comfortable and help them have the best time possible. Bring earplugs – I always forget that Oscar is noise sensitive at large events like this. He really wanted to see all of the acts, but was very distracted by the noise level. Calvin didn’t seem to mind it at all. If you have a noise-sensitive child, bring along some earplugs just in case! Timing is everything – We really wanted to attend opening night but we knew we were taking a chance by pushing back bedtime. This is a 50/50 shot for us because sometimes they adjust well, and other times, not so much. If your kids are on the younger side, I suggest seeing an earlier show on a weekend. Plan on eating – I didn’t realize that the show was as long as it was. This makes it a great value, but even after having dinner we were all ready for some popcorn (and it was GOOD too)! Whether you bring a snack or buy one, definitely plan on munching on something. And don’t forget bottles or sippy cups for the littles! Take a break – Have at least one other adult with you so you can take smaller kids into the breezeway for a minute or two or a bathroom break. Young children can get overwhelmed by all of the visual stimulation and may perk right up after a little breather. Relax – Remember the point of going to the circus or any other live event is to have a great time as a family. Lower your expectations of what that means especially if you have young kids. Don’t worry if things aren’t exactly as you imagined or you have to leave early. Your kids will play off of your anxiety levels so if you are relaxed and having a good time they will (hopefully) pick up on it! Have you been to the Circus lately? I’d love to hear your thoughts! If you are in Raleigh, you can see Ringling Bros. and Barnum &Bailey® Presents DRAGONS through February 10th! Tickets on sale here. Disclosure: My family received tickets to attend and promote this event. All opinions are my own.